Hereditary Princess Sophie has given a rather rare interview to mark the beginning of Liechtenstein's tricentennial anniversary year. You can read the interview in German at Vaterland. As its always interesting to get an insight into royal life, we took the liberty in translating the interview. Please keep in mind that we are no pros when it comes to translations and some things may have been a bit more smooth in the original interview. This is an unofficial translation of the interview done by us. Can you say what went through your mind when your first heard of Liechtenstein? I can’t actually recall when I first heard of Liechtenstein so I couldn’t say what went through my mind. And what went through your mind when you first visited? My first visit was during a summer weekend in the early 90’s. My husband invited me together with several friends. I really enjoyed the visit, I thought that the country is beautiful. To this day I am amazed everyday by the wonderful view over the Rhine valley you have from the castle. You first met your husband during the birthday party of a cousin in Munich. Was it love at first sight? No, it wasn’t. (Laughs.) It took a while but after the sparks finally flew, everything went very quickly. You became a Liechtenstein citizen upon your marriage. After a few years together in London with your husband, you moved to Liechtenstein. Was it tough for you to ultimately leave your native behind? No, that wasn’t hard for me. My mother is from Sweden, my paternal grandmother was from Hungary. So it was a pretty natural step for me to leave your native behind after a wedding. Of course I’m happy to go back to Bavaria every once in a while and visit my family. Sometimes it would be nice if I could go more spontaneously for a quick visit. But it was never hard for me to leave Bavaria. 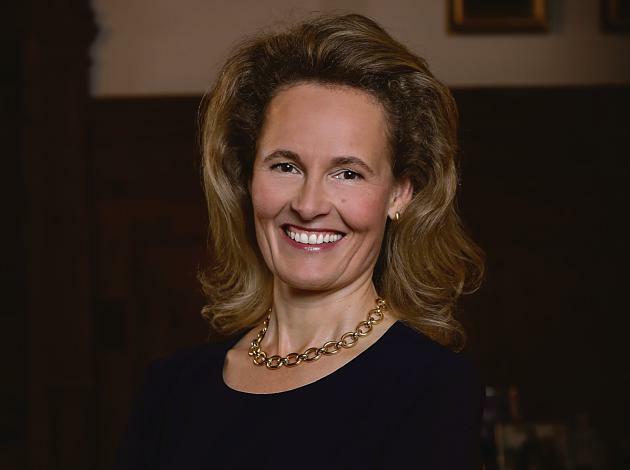 What did your friends and family say when you decided to marry Hereditary Prince Alois and for Liechtenstein to become your new home? My family was very happy. They already knew my husband as he came to visit us often. My husband studied in Salzburg so my parents' house wasn’t very far away and also practically on his way back home. Putting your hand on your heart: What is the biggest difference to your former life in Bavaria, where you grew up very sheltered with your four sisters and went to the local village school? There actually isn’t that big of a difference. The differences to my childhood and youth are mainly due to a new phase in life. Life as a wife and mother presents different challenges to you than life as a child or teenager. What do you appreciate most about the country and people? A lot! I like the innovative energy and inventive spirit of Liechtensteiners, their diligence and awareness for quality. Things have rhyme and reason. I also appreciate the Liechtenstein humour, the straightforwardness and especially the easy-going informality. And, of course, the love for nature. Can you tell us about your favourite place in Liechtenstein? That’s really tough, there are so many beautiful spots in the country – and I keep discovering new places, where I love to spend time. That’s something very special about Liechtenstein, there are so many beautiful spots and places. There are not too many traditional Liechtenstein dishes. But are Riebel (a corn-based traditional dish of the region) served now and again at the Schloss? Yes, but it has been a while. Actually, we really need to have Riebel again soon. How good is your Liechtenstein dialect? Do you sometimes speak it? Sometimes something just comes out in dialect – but I’m pretty certain it sounds awful when I try to speak it. My children, who of course speak the dialect, have always forbidden me to speak it – and rightly so. In difference to other monarchies and royal houses, the Princely Family lives a very private life and isn’t present in the international media. Do people recognise you when you go abroad? No, not at all. I find that to be very pleasant, as you can move around freely. Imagine you go filling up your car on the motorway and then people recognise and speak to you at the cash-out. I would be quite embarrassed. In Liechtenstein you also move around freely and mix with the people. We can meet you shopping in Vaduz, for example. How do Liechtensteiners react when they meet you? There is no big reaction by Liechtensteiners. It’s normal for them that we also have to do our shopping. That’s exactly what I appreciate about Liechtensteiners. You nod, say hello and if you know someone you talk a bit. That’s all very uncomplicated, just how neighbours are. Sometimes there are some foreigners who actually react when they see you as they didn’t expect to meet you. But luckily they mostly don’t recognise us so you can go about your daily life and run your errands like everybody else. One time – and it really was the only time it happened to me – there was a small group of American teenagers who bought a few postcards in Vaduz. One of the girls recognised me as I walked by. She ran after me with the postcard in her hands and asked, „Is that you?“ – we did have a good laugh about it together. Your four children are all grown-ups now. How do they do and what experiences did they have with the last name „Liechtenstein“? You are very socially active and have your own foundation. You are also the President of the Red Cross and patron of the animal welfare association. Do you think that the state of Liechtenstein equally does enough in the social sector? In countries like Liechtenstein, the state maybe does a bit less than in countries with higher taxes. That way the people are more independent what to do with their means. But this independence brings along responsibility. Our system makes it possible and easy for active and engaged citizens to be free with their own means but also be supportive the more vulnerable. There is a lot less bureaucracy and so you can help quickly and solution-oriented. The responsibility lies with the people, the citizens don’t immediately call for the state to help. Maybe it’s even more social in the long-term instead of taking away the responsibility from the people. It seems important to me that people coming from abroad to live here need to be thoroughly informed about our approach. Some people say that our high standard of living and prosperity is starting to annihilate core values such as charity, benevolence and loyalty. Do you see the same danger? Of course there is a danger. Maybe it's due to the declining importance of religion, though this may also be connected to the increasing prosperity. However, I also think that especially here in Liechtenstein there are always a lot of open ears and hearts when people are in need. I’m very thankful and touched by the many donations to the Red Cross. We also have a lot of privately founded aid organisation in Liechtenstein that always impress me. The UN migration pact is hotly debated right now. Our politicians are very skeptical as debates in the parliament have shown. What do you think about the topic? I believe that it is a very diverse issue and I have to admit that I haven’t read the UN migration pact myself, so I cannot say too much about it. Both my father as well as my mother-in-law had to flee before, during or after World War II. Without the possibility to go to and stay in another country, neither my husband nor me would possibly exist. There needs to be help for people fleeing from war and crisis zones. Ideally, refugees should be relocated close to home with the goal to make it easy to return home one day. And, of course, it is important for a country to make sure that the intake is not uncontrolled. Which personal goals would you like to reach in the coming years? Are there projects that are especially close to your heart? There aren’t any new projects at the moment. My current projects give me great pleasure and occupy a good deal of my time. Personally I wish to have a bit more time for the family. Apart from our children, who are all adults now and study abroad, I also mean my family with that. What will Liechtenstein look like in 50 years time? That’s what I would like to now! I’m very curious, how technical developments, climate change, the population pyramid and demographic structure will change. How the limited resources will be managed, how our changing society will deal with the questions and challenges of the aging society, decreasing fertility rates and the sad development of genetically engineered children. At the same time our society longs to go back to the roots, acceptance and authenticity. At the same time we are very open to technical developments yet also fear how they will influence our lives. A lot of interesting questions that I don’t have the answer to. Looking to the future of the country – what do you wish for? Peace and safety for our country. Wisdom, foresight and humility of all policymakers. Serenity, confidence and, of course, God’s blessing for the people of Liechtenstein. P.S. We have also updated our post of yesterday's anniversary celebrations with picture and video links - simply have a look here.